Citi has launched a new banking machine in Asia that’s designed to eliminate the need for a branch visit for most types of transactions, including opening accounts and loan, card and cashier check applications. 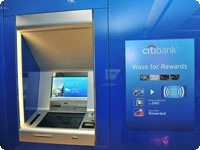 The machine, dubbed “Citibank Express,” comes with an online banking connection, video conferencing capabilities and biometric authentication. Customers can also integrate usage of home computers or mobile devices with Citibank Express transactions. The device has a split screen that enables interaction with a customer service representative while conducting transactions. The machines are NFC-enabled and can handle scanning and embossing. Future functions include instant printing of credit and ATM cards. The machines are available in Citibank branches in Singapore, Malaysia and the Philippines. The company will add more in-branch and out-of-branch locations throughout Asia and the rest of the world this year.